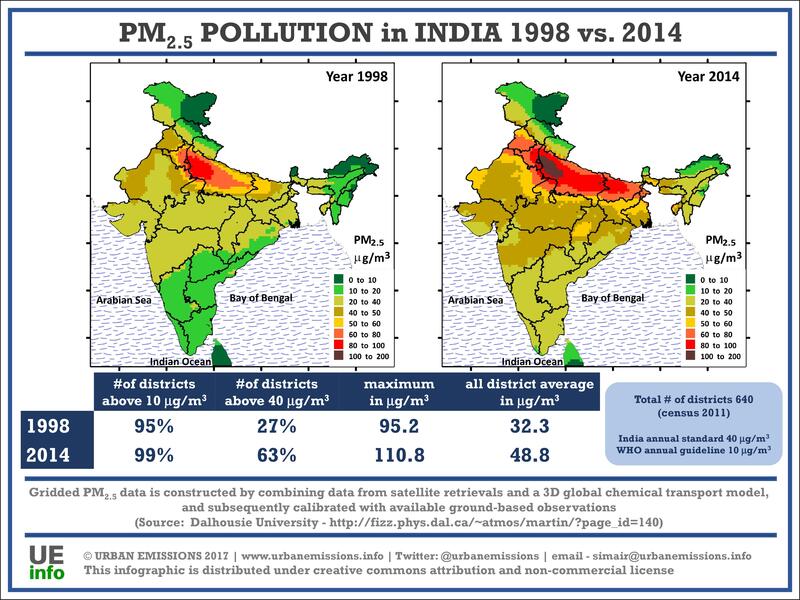 The maps below (for India) presents data extracted from a global database distributed by Dalhousie University. The data is available at 0.1° and 0.01° resolution. We utilize the later to build these maps, aggregated to 0.25° (which is our modeling domain resolution) and also aggregated to state and district levels. The global dataset is available in multiple formats to import and use on multiple presentation platforms. Note: Satellites are not measuring one location all the times. A combination of satellites provide a cache of measurements, which are interpreted using the global chemical transport models to better represent the vertical mix of pollution and finally arrive at the ground-based estimates with the help of past ground-based measurements. The global transport models rely on gridded emission estimates for multiple sectors for multiple years to establish a relationship with satellite observations over multiple years. The global PM2.5 files are available @ Dalhousie University. Individual gridded maps for years 1998 to 2014 are available here. The state and (640) district boundary shapefiles from 2011 Census are available here. All the re-analysis and interpretations are sole responsibility of the authors @ UrbanEmissions.Info. Please send your comments, questions, and data requests to simair@urbanemissions.info. What will it take to make Indian cities environment smart? We would like to thank the Shakti Sustainable Energy Foundation (Delhi, India) for their support towards this research.